DICKSON AND LENTINI SHARE JIM SULLIVAN MEDAL FOR 2018! 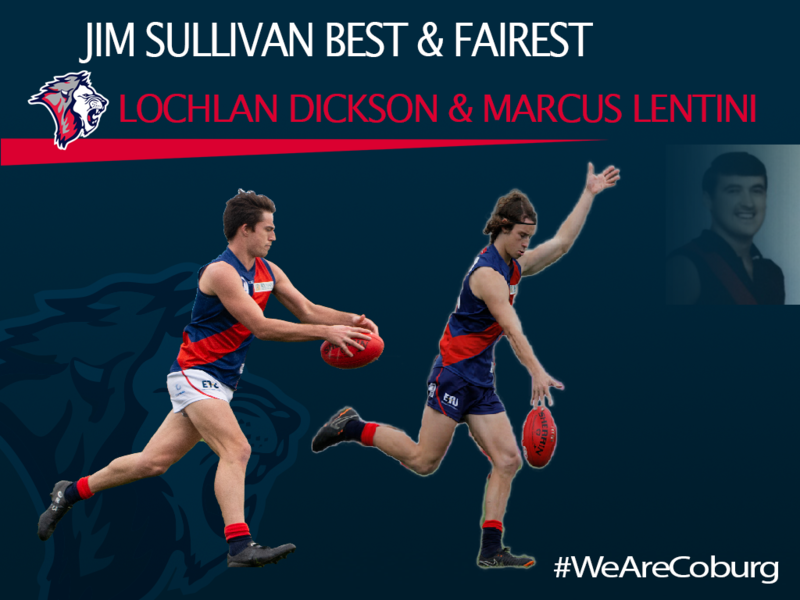 First-year players Marcus Lentini and Lochie Dickson have shared the 2018 Jim Sullivan Medal, polling 96 votes eachto be named the best and fairest Coburg players for the season. Both were red-hot favourites heading into Friday night’s count at Aurora Receptions, featuring in all 18 matches and putting in impressive weekly performances in their maiden VFL campaigns. Lentini, 19, finished the season with 509 disposals, co-leading the total possessions for the overall competition. The Diamond Creek junior and former Northern Knight averaged 28 touches, 14 contest possessions, six tackles & seven clearances per game, and regularly found himself leading the stats sheets. He recorded a career-high 41 disposals in round 20 against Geelong, and was also named in the VFL Team of the Year at Monday’s JJ Liston Trophy Night. Dickson, 24, completed his debut season with a total of 374 disposals, making him one of the competition’s most prolific defenders, and finished in the top 5 for rebound-50s, recording 74. The Norwood recruit and premiership player is known for his clever ball use and tough defensive efforts, averaging 20 disposals and five marks a game. He notched up a career-high 30 disposals in round 11 against Footscray, and was named among Coburg’s best performers nine times. Both have already signed onto Coburg for season 2019, where they will look to continue developing further as senior VFL players. Taking home the Jim Sullivan Medal in their first seasons at Coburg is a remarkable effort, and great reward for their stand-out seasons. Lentini and Dickson finished just a single vote ahead of runner-up Ryan Exon, and 12 votes clear of third-placed Nick Mellington. Sam Lowson took an early lead in the count before missing games through injury, while Dickson and Exon were two of the main frontrunners. Lentini was able to move up the ranks as the rounds progressed, and approximately halfway through the count cemented themselves as the three to beat. This is the fifth time in Coburg FC’s history that players have tied for the Jim Sullivan Medal; the last being in 2015 when it was shared between Daniel Venditti and Michael Hartley. Congratulations to Marcus and Lochie for being named the 2018 Jim Sullivan Medallists!